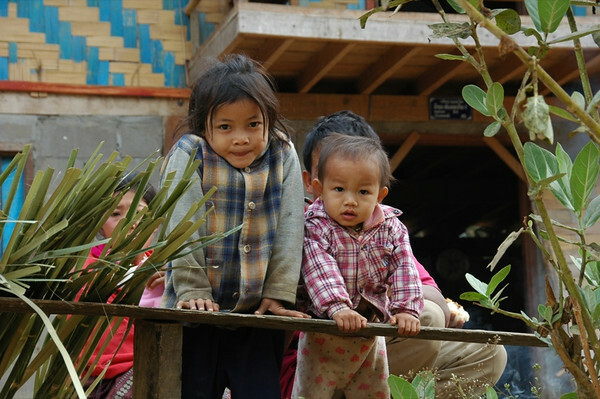 Our trek outside of Luang Prabang takes us into the hills past Khmu and Hmong villages. Our guides, two young Hmong men, fielded questions - from life in the villages to the American bombing of Laos in the 60s and 70s. Read more about the three levels of hill tribes we encountered on this trek. 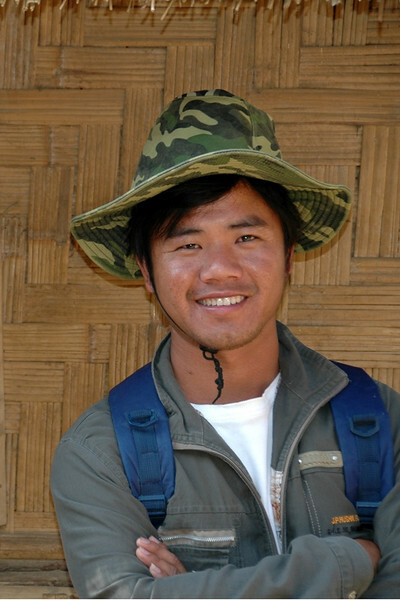 One of our two Hmong guides who led us over hills, through villages and across rivers. Our guides were both students in Luang Prabang and worked on the side to supplement their income and improve their English. Read more about the three levels of hill tribes we encountered on this trek. Read more about the three levels of hill tribes we encountered on this trek. In the first village, elementary school was in session. Teaching is hard enough in these conditions - large classes, old chalkboard and chalk, no books - but to do it with your baby strapped to your back takes it to a new level. We dropped off some books from the book publishing and literacy program, Big Brother Mouse. As we did, kids curiously peered out at us from the classroom. Read more about the three levels of hill tribes we encountered on this trek. 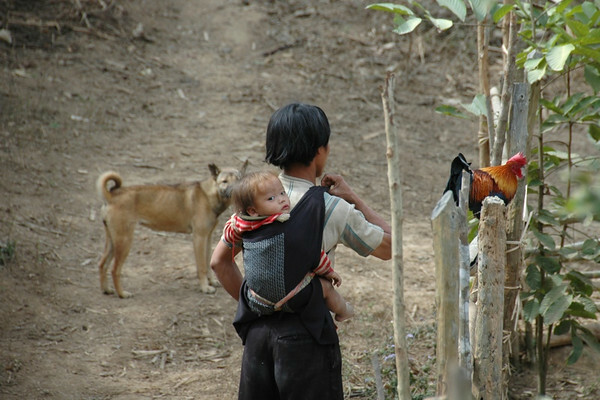 The Hmong are known for living in the hills and highlands. Their homes are on the ground (as opposed to other ethnic groups who build on stilts), in order to occasionally accommodate livestock and protect against the highland winds. Read more about the three levels of hill tribes we encountered on this trek. This family was in the first village on our trek. Villagers in the low land focus their efforts on fishing, agriculture, and selling the fruits of their labors in the town markets. Read more about the three levels of hill tribes we encountered on this trek. Hmong village families can be large; everyone pitches in. This girl doesn't seem that much older than her little brother, but still old enough to take care of him. 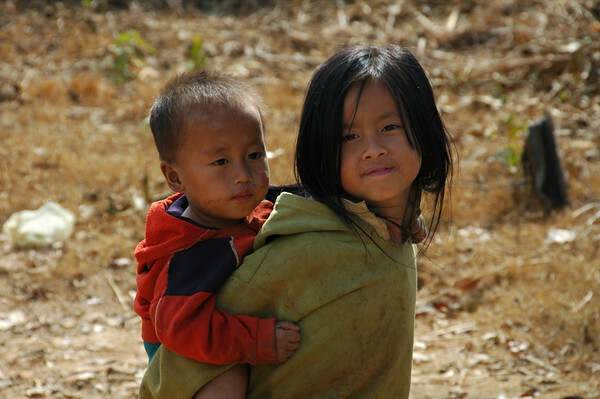 The Hmong, descended from Mongolian nomads, have higher cheekbones and wider faces than the Lao, or other minority communities such as the Khmu. Read more about the three levels of hill tribes we encountered on this trek. One of the Australian girls on our trek shows the kids the picture she's just taken of them. Given their reaction, it may have been their first photo. We found that showing people the images we'd taken of them served as an alternative connection when there was no common language. Most people really seemed to appreciate it. Read more about the three levels of hill tribes we encountered on this trek. This man was the chief of the Hmong village where we paused during our trek for lunch. He offered his house so that we could eat lunch protected from the sun. As we learned from our guide, village chiefs are elected by the village every couple of years. They are responsible for communicating with the local government, delivering news and enforcing new policies. There are elections, but only one political party. 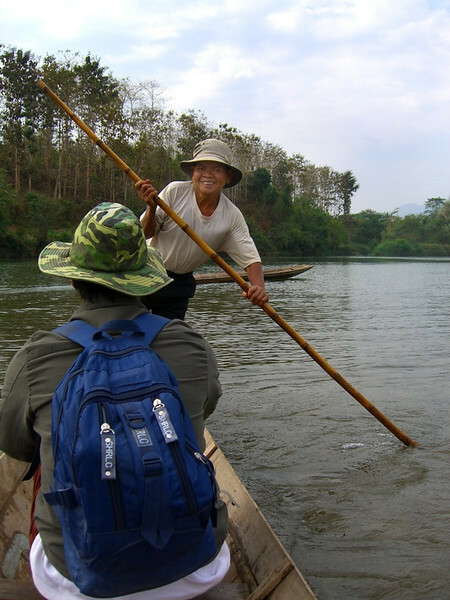 Laos is a communist country, but its flavor of Communism is different than that of Vietnam. People are hesitant to say anything bad about the government or question it. While in places like Vietnam and Cambodia people seem to complain about their corrupt governments quite a lot. Read more about the three levels of hill tribes we encountered on this trek. 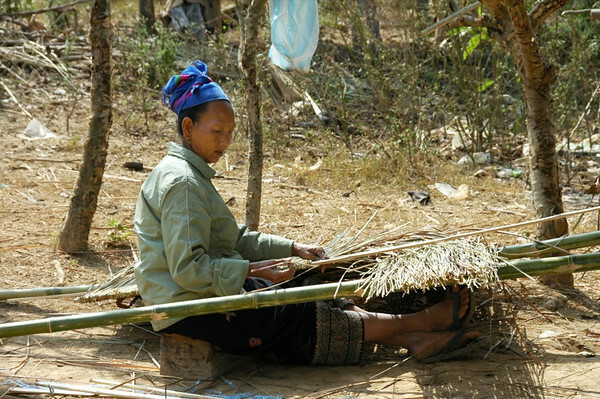 A woman ties reeds to a piece of wood for a thatched roof. 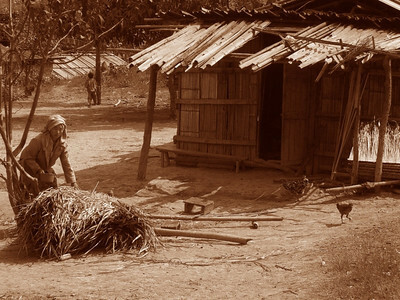 Because of the elements, a thatched roof is usually replaced every three years or so. Most houses now, however, have a tin roof to better protect against rain. If you live in the village and want a house, you must collect the materials. Apparently, once you've done that, the village men come together to help, making it possible to build a simple house in one day. Read more about the three levels of hill tribes we encountered on this trek. 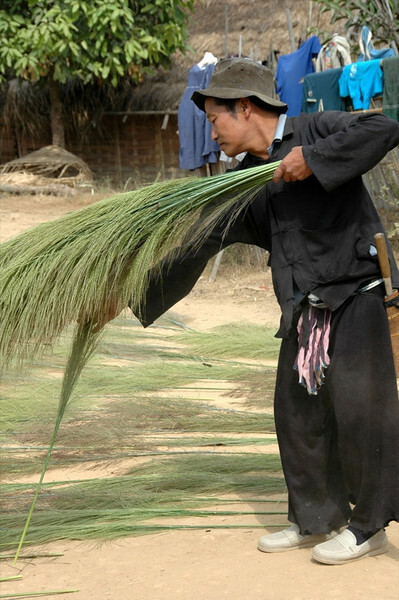 We saw people collecting and drying bamboo flower reeds throughout northern Laos. Apparently, they are for export to Thailand where they are used for making pillows, car seats, cushions and other products. For the villages in Laos, it's an easy way to make a little extra money during the dry season, as forests here are full of bamboo. Read more about the three levels of hill tribes we encountered on this trek. A father, his son, a hunting rooster and a dog - all one needs for a wild chicken hunting expedition. Read more about the three levels of hill tribes we encountered on this trek. 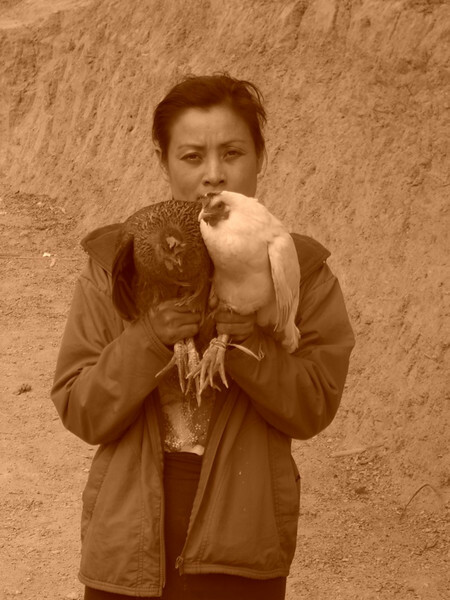 We saw several men walking along the paths with roosters on string attached to their arms. 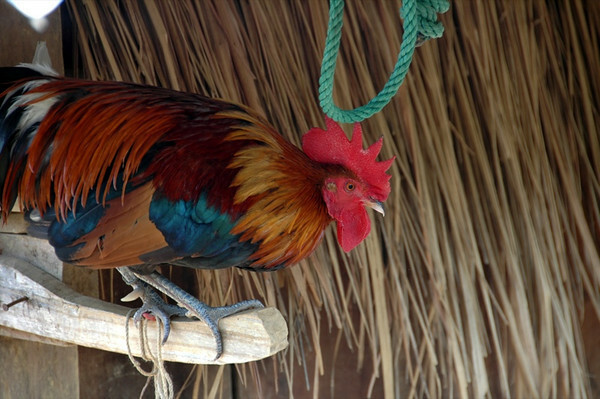 Our guide told us that these were specially trained hunting roosters, used to lure wild chickens out from the woods. Read more about the three levels of hill tribes we encountered on this trek. This little girl came running up to the path, clumsily waving at us like it was her first time. Read more about the three levels of hill tribes we encountered on this trek. Our day-long trek took us over the hills and through the woods. Read more about the three levels of hill tribes we encountered on this trek. 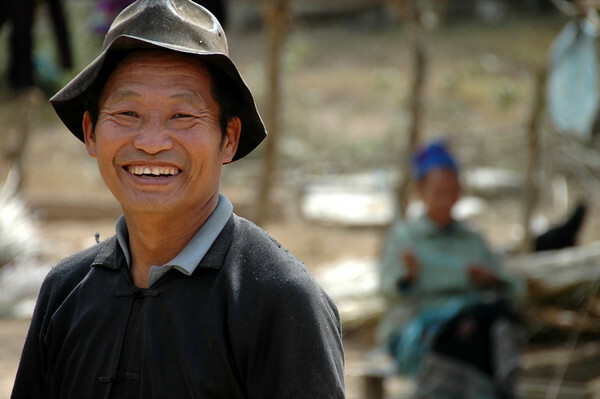 The physical features of the Khmu people are different than those of the Hmong and Lao. Our guide told us that the Khmu originally came from Cambodia (making them ethnically Khmer). After spending some time in Cambodia, we can definitely see the similarities. Read more about the three levels of hill tribes we encountered on this trek. 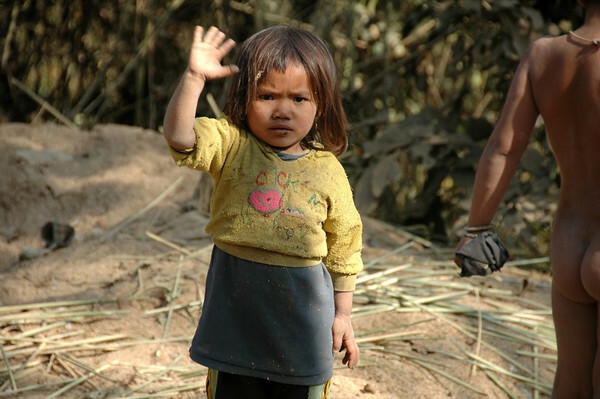 This little girl waves goodbye to us as we make our way back home through her village. Read more about the three levels of hill tribes we encountered on this trek. 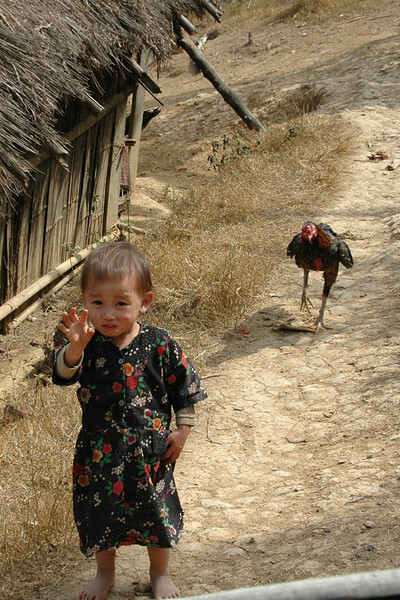 The last village we visited was a Khmu village. 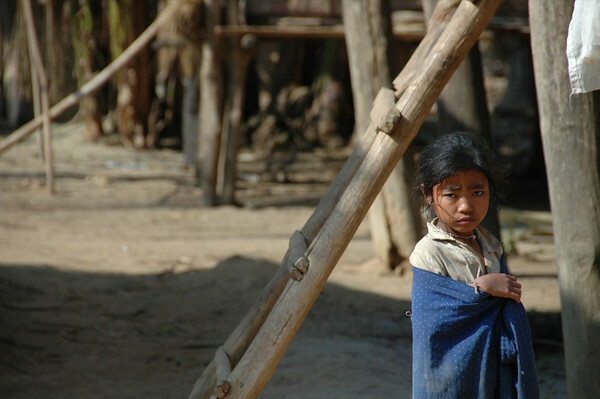 Khmu villages are normally quite poor and most do not have electricity. This one, with a new school and new houses, was relatively well-off. 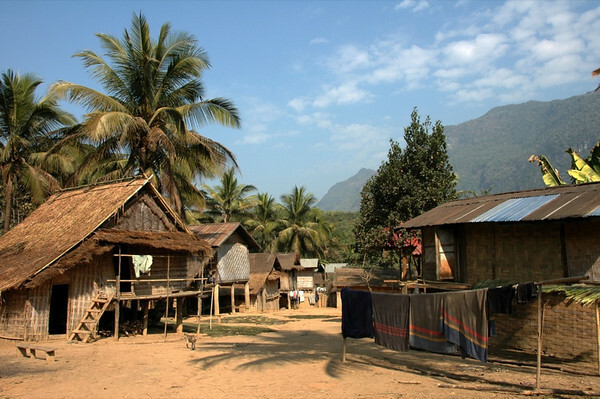 In contrast to the Hmong, the Khmu build their houses on two levels, with the main living area on stilts. Read more about the three levels of hill tribes we encountered on this trek. 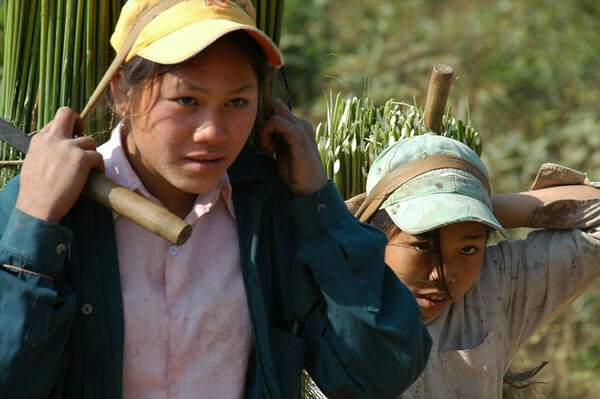 These Khmu girls were returning from cutting bamboo flower reeds in the forest. These are dried and then sold to Thailand in bulk. 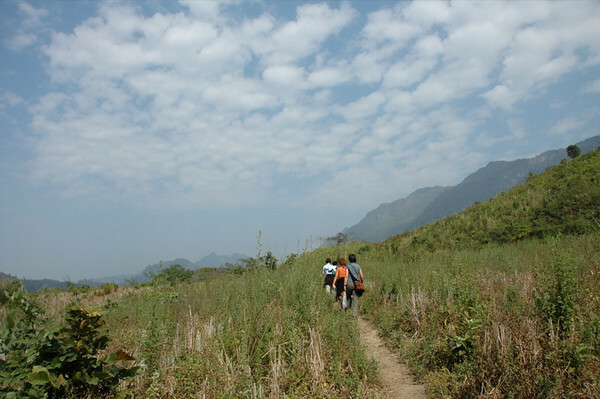 Read more about the three levels of hill tribes we encountered on this trek.